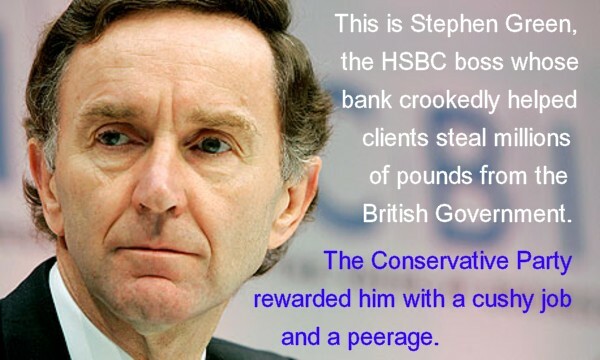 With people like this in charge of banks – and then going on to important roles in Conservative-led governments, can either the banks or the government be trusted to do what’s right for UK citizens? Banks and other financial organisations want the Conservative government to slash the cost of complying with new regulations, according to the Confederation of British Industry. Doesn’t your heart just bleed for them? Thse are the organisations that sucked the UK into the global financial crisis and allowed the Conservatives to form a government after the 2010 election (they didn’t win it) with a false claim that Labour overspent. Now they want the regulations that prevent them from causing another crisis to be eased. Considering the banks’ record, it would be madness to do so. Let’s see how long it takes the Tories to comply. According to The Guardian, “As the City recovers from the financial crisis, companies are lobbying for an end to criticism of the banking industry and an easing of rules designed to prevent another crisis. Finance is indeed a big employer, here in the UK – but only because Conservative-led governments since 2010 have utterly failed to build up any other industry while continuing to pander to the banks. Meanwhile, the taxpayer has been supporting banks heavily, with 4.21 per cent of government spending – that’s £41 billion per year – being supplied to these very profitable institutions for no very good reason. And they’re complaining about the cost of regulations! The ring-fence required by 2019 to separate retail and investment banking, so that bad investments cannot affect the safety of depositors’ money. The introduction of criminal liability for senior executives whose reckless behaviour causes their company to fail. That’s right – bank bosses are angry that the government is actually trying to stop them from penalising ordinary account holders for their gambling losses, and upset that they might have to pay a debt to society if their decisions harm the viability of their firms. Clearly these bankers have not learned their lesson and want to inflict further debt upon the taxpayer while making off like the bandits they are. This is the bank that, earlier this year, was implicated in one of the biggest organised tax avoidance schemes to be uncovered in the UK in recent times. It is important to note that the survey was compiled with accounting firm PwC, which has been singled out by HM Revenue and Customs as having created hugely lucrative schemes to help companies and the hugely wealthy to avoid paying their taxes. Shouldn’t the government’s response be: “F*** off, then – but pay your back taxes first”? The last thing the government should do is give in to these demands, and taxpayers across the country should write in to George Osborne, warning him against any such move. There is no reason to trust the banks with any more responsibility than the bare minimum. They simply haven’t earned our trust back yet. If the banks want more freedom, they should be told to bloody well earn it. If they want regulations cut…..then they are on their own…No bail outs…?You f*** up…you are on your own..Years ago if investors bought into these corrupt banks as shareholders they were held equally responsible for any losses……that should be applied again and then see how many dodgy deals get done….My guess is not many. Georgie-porgy proposed an Act to bind future governments to producing a surplus “in normal” economic times, as a political trap for Labour (or so he thinks) into promising to future “good economic behavior” (again, highly debatable term). Yet his mates in the banks baulk at the notion that they could possibly stay in the UK and have to not be criminals! The wall separating retail & investment banking used to exist, because the consequences of not separating them were obvious, and lo!, it came to pass that the consequences were realised after the wall was taken down. It badly needed reinstating to protect our money. However, I would worry about the govt using this to ring-fence private deposits for a “Cyprus solution” in the next banking crisis aka the bail-in, whereby depositer’s money, not govt funds, are seized to make good shortfalls, and then issued with junk bank bonds. The wall would in fact protect the investment banks, hedge funds etc. from seizure.